The new glass façade gives a full view of the entrance lobby, where show titles are posted on the rear wall. Gallery offices extend into the adjacent building. 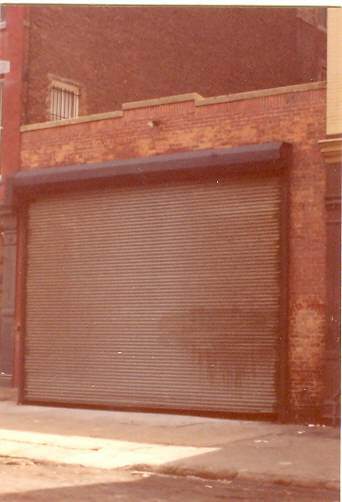 When the large rolling door is closed, the gallery assumes a nondescript industrial look on the West Broadway frontage. (Above) Gallery walls are reinforced with plywood under finished plaster board, allowing for secure hanging of artwork. The terracotta floors were inspired by the Uffizi Gallery in Florence. A view of the staff office leading to the director’s office, library, viewing area and art storage beyond. The art storage area employs flat file as well a cubicles for large and small canvases. The Director’s office is furnished with a eclectic mix of furnishings, including an antique Empire desk and Corbusier cube chairs. The Mary Boone Gallery has been a a major influence on SoHo galleries and is credited with attracting the uptown collector to the SoHo art scene. Ms. Boone accomplished this, in part, by transcending SoHo casual, in favor of a museum quality setting, which underscored the quality, importance and value of the work. The architects utilized visual and organizational simplicity as well as attention to all details of design and finish to achieve the spare elegant look of the space. The 5,000 square feet of space contain two galleries, private viewing area, general offices, art storage and a library.